omg i love this teacher it was funny when he said WTF??? and then "Technically yes, but never again." Happy dog, not happy squirrel! clapping for the teacher .. !! That's a squirrel? I thought it was Godzilla. Hahahaha they got full points too! What a teacher... I only wonder: did he really try to solve this mystery or did he just think ok it's fine you get your points? haha rofl i need him to come to my school-we`d get on. How on earth is that question worth 15 marks? Actually, this isn't quite right. Dog double prime = r^2 * e^(rt) + 1 * e^(rt). The product rule is kind of important. THAT TEACHER MADE MEH DAY!!!! wtf!! no really a teacher ACTUALLY made meh day!!! I´m agree. There´s no teachers like him in Spain. The teacher isn't really correct in saying 'technically yes', since, when getting in technicalities, it's not correct. The differential equation implies y is a function of x, but the student's solution ends with y a function of t. The student also doesn't specifically state that c1 or c2 are arbitrary constants (which would have lost me marks when I did this kind of maths). did he carry the 2? 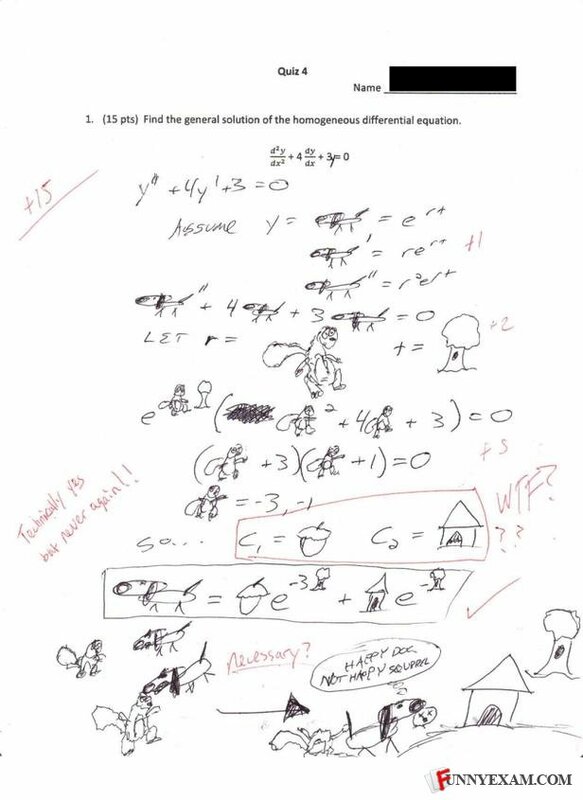 This kid needs to be a math teacher immediately. In Soviet Russia, teacher don't understand YOU! his(her) probalbley his,but teacher wrote WTF. men WTF..? And that, teacher, is my report on how babys are made. how is this technically correct?? What I love is the "necessary?" This made me laugh so much. Nice onee. I did this once with smiley faces. Got pretty much the same response. whats the biggest ever snake found ?